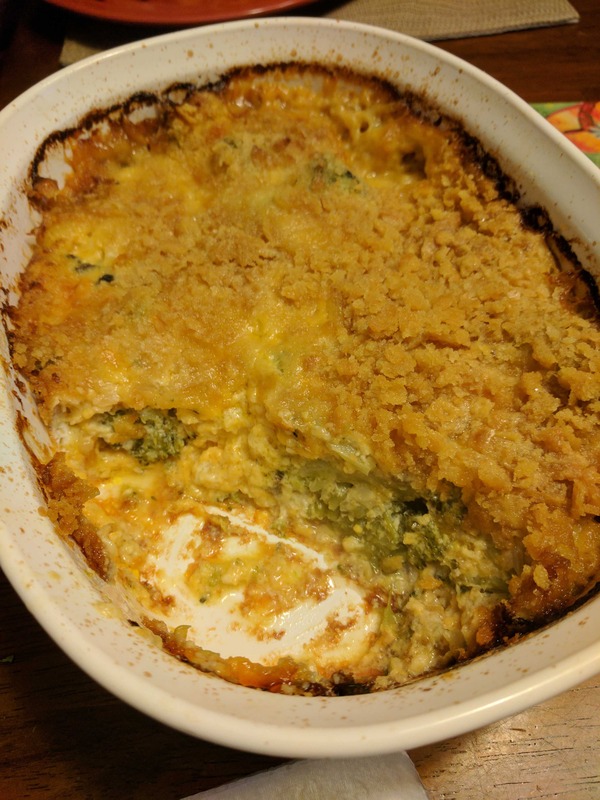 I remember as a kid having a casserole with nearly every supper. While they’ve fallen out of fashion, I still have fond memories of all the things my mom could do with a can of cream of mushroom soup. Here is a recipe for a side dish that is sized for a small family – double everything if you’re feeding a crowd! Steam fresh broccoli for 5 minutes (frozen doesn’t need this step). Thaw ad drain well if frozen. Sauté onion in a little olive oil until translucent, about 5 minutes. Combine soup, egg and cheese in a large bowl and mix well. Add in broccoli and onion and stir well. Pour into a quart casserole dish. Sprinkle crushed cracker crumbs on top and dot top with butter. Bake at 350 degrees F for about an hour, until golden and bubbly.